Nordictrack is a trusted name in the fitness industry, and the brand has been endorsed by celebrity fitness trainers like Jillian Michaels. 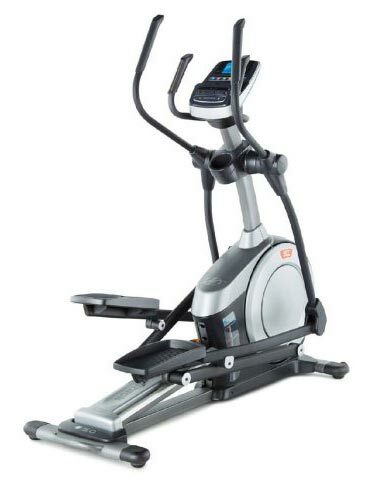 The E7.2 elliptical is a testament to the brand’s quality by offering a challenging workout for all fitness levels and the ability to target different muscle groups. 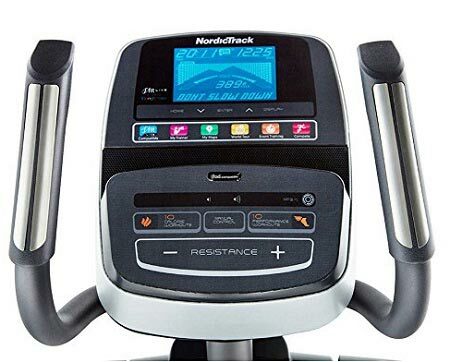 The Nordictrack E7.2 is designed for users of all fitness levels. With 20 digital resistance levels, built-in workout programmes, and adjustable stride length, you can create a workout that’s challenging for your own personal fitness level. With the E7.2, your workouts will be anything but boring. The 20 digital resistance levels allow you to create a comfortable challenge. The more challenging the workout, the more weight you’ll lose, and the more strength you’ll build. If adjusting the resistance isn’t giving you enough of a challenge, the E7.2 also features a manual incline ramp. The ramp has five positions and the option to adjust the incline from 0-20 degrees. On top of this, the NordicTrack E7.2 cross trainer features 20 built-in programmes to vary your workouts. Of these 20 programmes, 10 are designed for weight loss, and the other 10 are designed for performance. The E7.2 is also compatible with the iFit Live module, which gives you access to even more workouts. Using Google Maps, you can stride your way through a variety of cities, and take advantage of over 1,000 downloadable workouts. The adjustable 18-20 stride allows you to target a number of different muscle groups and choose a stride length that’s comfortable for you. Nearly every aspect of this home elliptical cross trainer was designed to help you gain results faster, and to keep your workouts interesting. As an added bonus, the E7.2 comes with a built-in intermix 2.0 sound system. Just plug in your mp3 player or iPod and listen to your favorite tunes during your workout. The build quality of this cross trainer is excellent. The console features a digital display, and you have two sets of handlebars to choose from. A stationary set allows you to work your lower body, while the larger set of handlebars will move with each stride to tone your arms and engage your core. The stationary bars also feature pulse sensors, so you can track your heart rate. A convenient water bottle holder is also included just below the console. The advanced console provides you with numerous controls. Just below the digital display, you’ll find a series of options, including: the iFit button, My Maps, My Trainer, Event Training, World Tour and Compete. Just below these controls, you’ll find the speakers, mp3 port and the buttons to select a built-in workout programme. The E7.2 truly is impressive. All of the included features are designed to make your workouts fun and interesting, so you look forward to training each day. Assembly will require two people, and quite a bit of time to complete. Expect to spend about an hour putting the E7.2 together. As with most equipment from NordicTrack it is one of the more expensive cross trainers available with a price-tag around £600. If you have a lower budget then take a look at some cheap cross trainers in our buyer’s guide, or take a look at a Roger Black cross trainer, which are good value for money. The E7.2 is nearly perfect, and we love almost everything about it. The only gripe we had was assembly wasn’t quick and easy. You’ll need two people, and it will take some time to get this cross trainer together. All in all, we loved the NordicTrack E7.2. 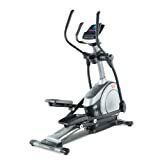 This is a cross trainer that you can continue using for years to come because of the variety of workouts, incline levels and resistance levels offered. Whether you’re a beginner or advanced fitness guru, the E7.2 won’t disappoint. We have done a few NordicTrack cross trainer reviews now and it easy to see why they have such a high reputation. They definitely produce the best cross trainers on the market. We hope you have found our Nordictrack E7.2 review useful and we wish you all the best on your fitness journey.